H40: 40 Years of Terror was purely and simply the ultimate Halloween movie franchise reunion, celebrating the 40th anniversary of John Carpenter’s original Halloween and four decades of Michael Myers with the largest gathering of men who have portrayed The Shape ever at one place, plus more than 70 cast members, directors, and producers from all of the films. The event took place in Pasadena, California, where the original Halloween was filmed 40 years ago, starting on Friday, Oct. 12 with the Horror’s Hallowed Ground Bus Tour hosted by Sean Clark, followed by the convention itself on Saturday and Sunday, Oct. 13-14, 2018 at the Pasadena Convention Center. The guest list was more than any Halloween fan could ever dream of, with no less than 19 men who have portrayed Michael Myers throughout all 11 films, including the originals from 1978, Nick Castle, Tommy Lee Wallace, Jim Winburn, and Will Sandin, and the newest actor to wear the mask in this year’s Halloween, James Jude Courtney. Halloween Daily News was at this landmark event for every killer moment, and we have a ton of coverage to bring you in the coming days, including photos, videos, interviews, and panel reports. You can see our first photo gallery below, and then be sure to visit the following links as well. Read our interview with Rhian Rees on Halloween 2018 from H40 here. See highlights from the Horror’s Hallowed Grounds Tour at H40 here. Watch and see photos from the Halloween 2018 panel from H40 here. 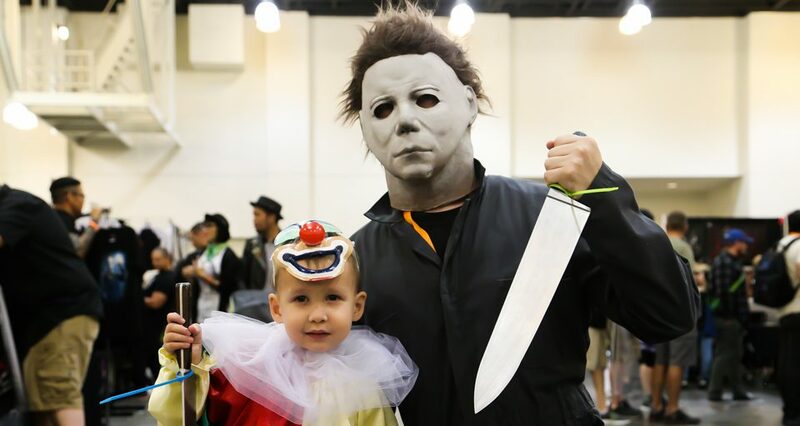 Watch and see photos from the Halloween II panel at H40 here. Watch and see photos from the Halloween panel from H40 here. David Gordon Green and James Jude Courtney at the ‘Halloween’ 2018 panel, moderated by Steve Barton.